Dentists and doctors have been seeing the harmful effects of sugar on the health of the population for many years now. Children’s teeth are ravaged by fizzy drinks, and many more children are suffering from obesity and diabetes. But the moment it is suggested a sugar tax is imposed everyone is up in arms in Putney. Many see it as an affront to their liberty as opposed to an essential step to protect the health of a nation, in the same way tax on cigarettes and alcohol does. The kids might be leaner, fitter and have better teeth, but woe betide anyone who tries to interfere with parents’ right to stuff them full of sugar. We were equally alarmed when fluoride was first added to drinking water, but the benefits we have all enjoyed, by having healthier teeth and fewer fillings, are now being eroded by our addiction to excess sugar, processed food and poor diet. If you need help with caring for your teeth and understanding the harmful effects of sugar, Alkali in Putney are delighted to help. Sugar is enemy number one, as far as the entire dental profession is concerned. But, unsurprisingly, the Food and Drink Federation are more concerned the arbitrary new tax recommended by the Health Committee, and recently debated in Westminster, would leave consumers paying significantly more, every week, for the products they love. Dr Sarah Wollaston MP, chair of the Health Committee, is challenging the sugar lobby. Her committee’s report has called for labelling of the added sugar content in teaspoons and a tax on soft drinks to change the habits of a nation. The committee also wants “bold and urgent action” to reduce sugar in food and drink and to restrict marketing and advertising of unhealthy products. It is a hard nut to crack. Influences from advertising and marketing overwhelm adults as well as children because they’ve been brought up in a similar way to the children, in using sugar as a reward, using sugar as a quick fix. Although it was recently debated by Mark Field, MP, in Westminster, “We are living in an age of more responsible and more informed consumers, both young and old. That is where the responsibility lies, and that responsibility has been put into place to a large extent, ” there is little evidence sensible parents are winning out over the uninformed and poorer members of society. Join the debate and change attitudes to excess sugar. With, or without, a sugar tax we need to save a nation by saying no to pop. It is not only children who like sugar. Adults grow up with a sweet tooth too. 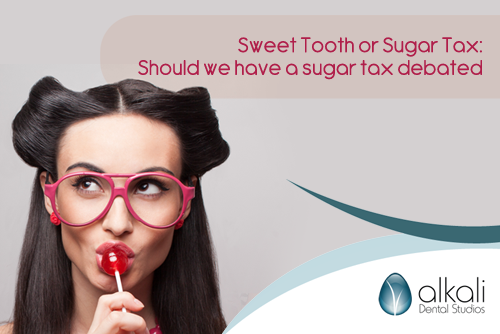 Make an appointment at Alkali Dental Studios in Putney to have your teeth checked before you pay the price of decay for your sweet tooth and sugar cravings.